The Nissan Kicks is here and it looks promising on paper. It’s longer than any other compact SUV or crossover in India, wider than the Creta and is quite feature rich too. It’s got a tried and tested diesel engine and underpinnings that have managed to impress us in the past for ride quality. So there’s quite a lot that already makes the Kicks a product to look forward to. Let us then get into the details and find out whether it’s the compact crossover you should put your money on or not. The Kicks’ overall design is funky and it would go well with those who like their car to stand out from the crowd. It’s available in dual-tone exterior colour schemes, and with colours that are bright and youthful. It’s got LED headlamps and DRLs, and these make it look modern. The front-end looks squarish, especially the way the headlamps, bonnet and fog lamps come together. The Nissan V-Motion grille at the front also looks bold. The rear, with those boomerang tail lamps, is unlike any other car you would have seen before in India; it properly stands out. The Kicks is in no way timid in terms of size, at least on paper. Dimensionally, it’s longer and wider than the Creta. Let’s get it straight, the Nissan Kicks is not an SUV in the traditional sense. It has a long foot print with raked A-Pillars and a prominent overhang which makes it look like a crossover. There’s a dose of black plastic cladding at the lower end all around, again a design element borrowed from SUVs, but seen on cross hatches too. But, it if it comes to purpose the Kicks has an important SUV trait -- ride height. Its 210mm of ground clearance and 17-inch wheels give it a purposeful stance. So, if you define road presence with respect to uniqueness of design, the Kicks is a car you should wait for. But if road presence to you is all about squareness, then despite being longer and wider than rivals, the Kicks might not cut it for you. Premium would be that one word to best describe the Kicks’ interior. Black-brown interior colour scheme looks elegant to start with. The brown panel on the dashboard and on the doors is done in leather, while the black plastic on the dashboard top is not exactly soft-touch, but feels upmarket. There’s leather finish on the steering and seats too, making the cabin feel rich. The plushness of the cabin is further accentuated because of good noise insulation. The diesel engine clatter inside the Kicks’ cabin is quite muted compared to its siblings. Someone looking for an expensive car experience under Rs 15 lakh should consider the Kicks. Apart from those who appreciate quality, the Kicks will also appeal to those who like their car interior to be cosy. In other words, the Kicks feels quite compact on the inside, good for those who don’t want to get intimidated by the dimensions when driving, but disappointing for those who’d rather prefer a spacious cabin. Blame it on the dark (black) colour scheme. There are some niggles too. The driver seat, for example, is set a bit on the higher side even in the lowermost position, an issue it shares with its platform cousin, the Captur. Those who’re taller than 5’8” will particularly feel like they're sitting a tad too high. You can push the seat back and tilt the steering lower to get into a relatively good driving position, but then you go farther from the steering, which sadly doesn’t get telescopic adjustment. And no, even if you manage to reach the steering, you still have to deal with another ergonomic issue -- cramped footwell. There’s not enough space for you to rest your foot on the floor on the left of the clutch pedal; you always have to take your foot off and and rest it on floor under the clutch! Tall drivers, don’t forget to test drive before signing the dotted line. And then, there’s no lamp for the passenger-side vanity mirror either. Audio (music) controls are not on the steering, but behind it, on a separate stalk. There are blanks on the steering where audio controls should be present. Controls for cruise control are there on the steering. Front armrest doesn’t slide forward. There’s no storage space under it too. It’s also designed in a way that it offers more elbow support to the passenger and not the driver! Instrument console gets digital speedometer. Rev counter and fuel gauge get big dials. Overall design is not as appealing as the cabin otherwise is. Its sloping roofline might make you believe that headroom at the rear might be tight, but that isn’t the case. Headroom and legroom at the rear is adequate for adults, however, it feels quite compact. The rear windows are large for a crossover with sloping roofline and the view out is unobstructed. Seating three adults abreast at the rear might be tight, but two adults with a kid should be comfortable. There’s a small fixed headrest on the rear seat for a child in the middle, and the rear AC vents are also ergonomically placed so that they don’t eat up a lot of leg space. That said, the Kicks seems to be a car for those who drive themselves, or have family with growing-up kids, and not for those who will be driven around most of the time. Boot space is rated at 400 litres, only 2 litre short of the Creta. The space is enough for a family’s weekend luggage. Only the diesel Kicks is available in the top variant and not the petrol. In terms of safety, the top-spec Kicks gets ABS with EBD and Brake Assist, Hill Start Assist and four airbags. In comparison, the Creta gets six while the S-Cross only gets two. 360-degree parking assist is one of the highlights and is exclusive to the Kicks in the compact SUV and crossover space. It uses four cameras -- one at the front, one at the rear and one under each ORVM to give an all-round view of the car when reversing into a parking spot. Other than this, the Kicks gets LED headlamps and DRLs, 17-inch alloy wheels, auto AC (standard feature), cooled glovebox, cruise control, fog lamps with cornering function, 8-inch touchscreen infotainment system with Apple CarPlay and Android Auto as well as rain sensing wipers. The 8-inch touchscreen on the dashboard looks wide. However, it’s not tilted towards the driver and is, therefore, not the easiest to operate when you’re driving. Compared to the top-spec Creta, the Kicks misses out on convenience features like auto-dimming IRVM, powered driver seat and wireless charger. It also doesn’t get a sunroof, unlike the Creta. A sunroof would have complemented the Kicks’ youthful vibe. Moreover, the Creta doesn’t get LED headlamps and 360-degree parking assist that the Kicks does. The Kicks is powered by the same set of powertrains as the Captur. So it gets a 1.5-litre petrol and diesel engine. The diesel engine, which we got to drive, is paired with a 6-speed manual transmission while the petrol engine comes with a 5-speed manual. On paper, the diesel engine develops 110PS of maximum power. While it’s not the most powerful engine in its segment, it never felt out of breath even at triple-digit speeds. Cruising at highway speeds should be an easy task for the Kicks then. However, overtaking or picking up quick pace will require downshifting. The diesel engine makes 240Nm of maximum torque at 1750rpm, but you only make quick progress when the rev counter goes over 2500rpm. The drive pattern will also have to be adjusted when driving in the city. So while it will continue to march forward at 1500+ rpm, picking up quick pace will require dropping gears. The Kicks might look sporty and agile on the outside, but its ride is tuned for outright comfort. The suspension easily soaks any small or big undulations at both slow or high speeds. Despite tuned to be on the softer side, the Kicks doesn’t throw its passengers around when negotiating uneven surfaces. The comfortable ride adds to the richness of the cabin and the overall package exudes sophistication comparable to cars from a segment above. The Nissan Kicks seems to be doing a lot of things right. Its striking youthful design and premium quality interior work in its favour. The dynamics are sorted and the mechanicals are proven as well. It’s got most of the contents to be a great urban SUV, but there are some downsides too. The Kicks doesn’t feel big despite being amongst the largest cars in its segment. The cabin doesn’t feel spacious either. There are some ergonomic issues as well that might bother some drivers and it’s not the most well-equipped car too, missing out on features like auto-dimming IRVM and sunroof, both of which would have added immensely to its appeal. And then there’s the absence of automatic transmission. 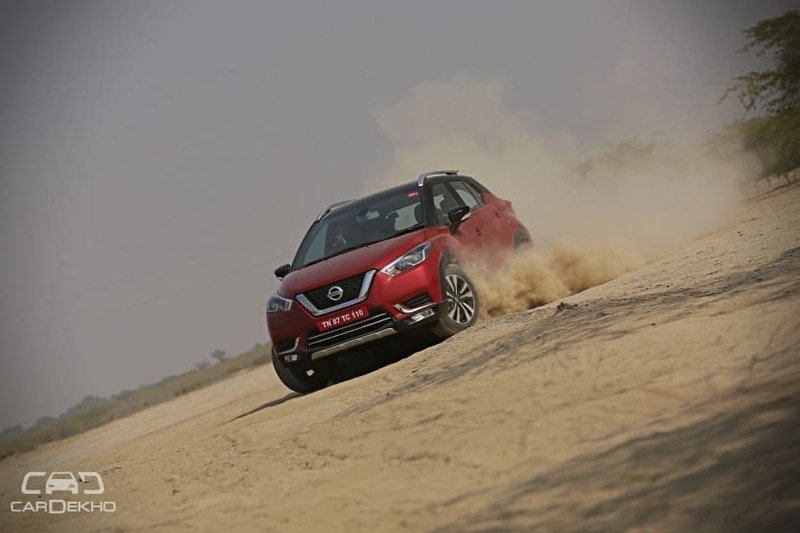 Considering both the pros and cons leads us to the conclusion that the Kicks is a car for those who are looking for a properly stylish compact SUV. It’s for those who appreciate quality and are either buying an additional smaller (relatively) car for the family or want to upgrade their drive experience from an already premium sub-compact vehicle. The prices of the Kicks start from Rs 9.55 lakh and go up to Rs 14.65 lakh. At this price, it appears to be a little expensive for what you get, especially for the top variants. If it's the base spec Kicks that you are considering, then it does come across as a competitive car in this segment.